hardened in combat and trained for action! During a space border patrol, you receive a code red distress call. The Rakkai Empire is invading the planet! As one of only a few highly skilled survivors, you must use overwhelming firepower and all of your combat skills to battle the hordes of hostile ground troops! 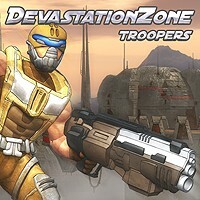 Fight through more than 50 levels of intense action and use your arsenal of weapons to destroy everything in sight! query: INSERT INTO accesslog (title, path, url, hostname, uid, timestamp) values('Devastation Zone Troopers', 'node/1464', '', '3.80.224.52', 0, 1556142845) in /home/surelion/public_html/drupal-4.6/includes/database.mysql.inc on line 66.